I purchased a Casio ladies digital wrist watch for my wife, who sadly can no longer read a clockface as she suffers from dementia. She was very pleased and surprised to receive it as a Valentines Day present. We are both very happy with the watch, which works perfectly for her. I was very pleased to receive the watch just a few days after buying it online - a very good service indeed. 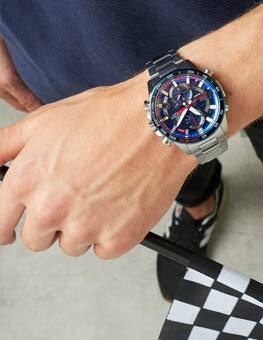 I bought this watch for myself after buying the Unisex Casio Classic Leisure Alarm Chronograph Watch A168WG-9EF for my boyfriend. I wanted us to have matching watches.The watch is small and fits my wrist perfectly. 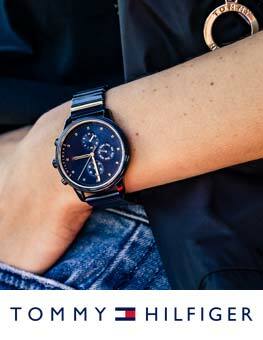 This watch is great for small wrist, chic and functional. Before I was never wearing a watch as all of them were too big and they bothered me, I dont feel that I wear a watch now. And I like the timer, as I have no idea how much time is 15 minutes and I am always late : I will put also photo with the watch on my arm. Great value for money. Really like this watch. Im very happy with this purshase. I had the option collect the item at a convenient time and place that suited me. The service was reliabe and efficient. Great product, can adjust the straps to any size. I bought it for my daughtet at christmas and she loves it. Lovely watch, very clear instructions, not often that you get a nice neat digital watch.. I purchased another watch because the first one has been great. Very easy to see if you have sight problems\\\\\\\\r\\\\\\\\nand I have not had any problems with setting time etc. Great watch, works well - only compaint was I did request a specific size but I dont believe this was implemented as I had to go and get it made smaller after receiving it. Its a bit small and it doesnt show the day of the week like the bigger one. I would prefer a 24 hour option. The one weakness is that the strap is only gold plated/coloured on the top/outside of the strap bracelet rather than all of the metal. Not noticeable but visible. Casio watches are my choice for something that tells the time, works, waterproof, no fancy gimmicks that fail. I would rather buy 10 casio watches than one £300 watch that still packs in because the design budeget went on looks and fancy functions rather than the main function. Maybe Im a tight old git. I am very happy with my purchase. \r\nExactly what I expected and the delivery time was very good. The package was assembled in order to protect the contents.\r\nIt was my first purchase at watchshop and I do recomend to everyone. Super fast service, easy to use site.grateful value too! i found the site very easy to use the products are as described and the value is very good with a quick delivery , i have used this site several times and would not hesitate to recommend or use the site again. Lovely watch. fits perfectly and the size is great as it isnt very big so it looks dainty. It is less yellow than in the picture, its more gold. Lots of features, Ive had lots of compliments whilst wearing. The gold on the adjusting length has wore off a bit though, so just be careful. While at work too, I accidently press alarm, so watch out for that. Overall, great womens watch. The watch is perfect, I have small wrists and I was able to adjust the strap easily to suit my size. Delivery was very fast and I received the product the day after purchase, very very satisfied and would buy and recommend The Watshop to family and friends. Exellent Casio watch with all the functions you need, Attractive, classy classic Casio, what else would do? Other half loves it. Very good gift, looks the part, easily adjusted strap for wrist size no need for jewelry shop to take links out, suitable for all ages. The display is very easy to read, and looks a good size on the wrist - not too clumpy and not too small. Purchased for girlfriend and upon showing off the watch all family members and friends was impressed. Very good value for money. 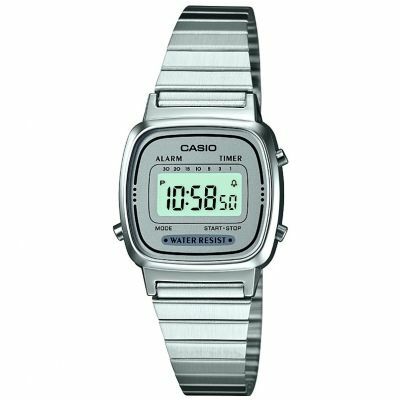 Brought this watch for a friend as she saw another similar casio which I purchased for my step-daughter at Christmas time and loved it. I purchased a smaller faced one for her as she has small wrists and it looks perfect. She was very pleased. Nice little watch with quick delivery. This watch looks even prettier in real life. Despite metal its so light I often forget I am wearing it. I love this watch, its really small and neat on the wrist and goes with just about everything, from costume jewelry to more expensive pieces. My daughter wanted a watch that actually fit her as she only has tiny wrists. This is a lovely watch, really neat and tidy and looks even prettier than the picture shows. I brought this as a gift for my 14 year old daughter and she loves it. Its just the right size for her and simple yet elegant. Really love this watch - its the perfect combination of neatness and gold exaggeration. From past watches that Ive owned by Casio, I know that eventually the gold will rub off and itll look grey but this doesnt tend to happen for a long time. This watch is amazing. I love the size and how it looks on. Got a lot of compliments. U wear it a lot more than my MK watch lool. Thanks to the watchshop team fast delievery and it was adjusted to fit me properly. Great product! Watch is exactly what my girlfriend was looking for it made a fantastic Valentines gift. The strap needed adjusting and was very simple to do. Simple interface to use! Only downside is the lack of the light! Great value for money watch that looks hip and classy at the same time! I am so happy with this purchase! I love the size as it is not too big and not too small. It is easy to put on and off and its easy to adjust it. I like the colour, style and the fact that it has an alarm on it. I would defiantly recommend this item!! Ive wanted this watch for over a year and just got round to buying it this Christmas. It arrived this morning and is even better than Id imagined. The colour is slightly less gold than it looks in the picture, which for me is a good thing - it looks a lot more expensive than the price I paid. Its also quite small so its not too clunky on your wrist. Overall Im thrilled I bought it! good quality - neat and smart looking - the strap was easily adjustable. A surprise Christmas gift and our granddaughter was delighted. Product was as expected, good quality and condition. Overall happy with product. Product delivered and received as ordered. The watch is good and is a present for my daughter at Christmas. Item was a good price arrived within delivery time and was well packaged. 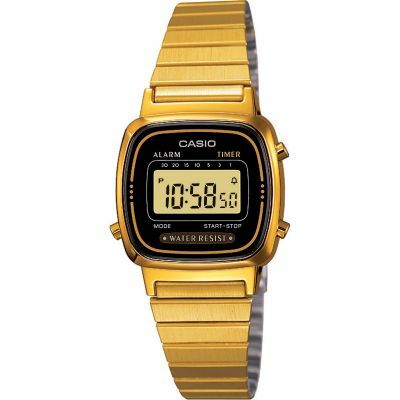 I bought the small Casio gold watch it is very classy and elegant, I am very happy with my purchase. Really impressed. Speedy delivery and a lovely watch. Would definately recommend it! Watch is smaller than I expected but it is good value for money. Shopped around for this watch and watch shop was the cheapest . Happy with the purchase. Great looking watch, the only thing is it is smaller than it looks in the picture, but to be honest I liked that it looks more expensive than it actually is, the colour of the watch was a lovely gold tone not cheap looking at all. Thank you very much. Fast delivery,great gift package.I am totally pleased with my purchase. A great watch great service! The watch is good quality amd very easy to use. 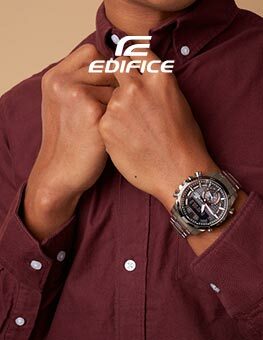 The product is very small, the face if the watch is smaller than what it looks like in the picture, but this makes it look more elegant and sophisticated. My sister tried on her new watch and loved it! The coloir is gold but it looks very classy when she puts on a few simple gold rings with it! However this is one problem, this is that the set up so as in settting the time and date is very complicated, the guide does explain it to you but in a very awkward manner, so if anyone buys this look on youtube on how to adjust the wrost and set the time, its much easier! Overall a very beautiful simole product and i will hopefully be buying myself one too! The watch which I purchased was as excellent as I had hoped. Despite being an alarm watch, which I need to remind me to take important medication, my new watch is compact, neat and totally reliable. 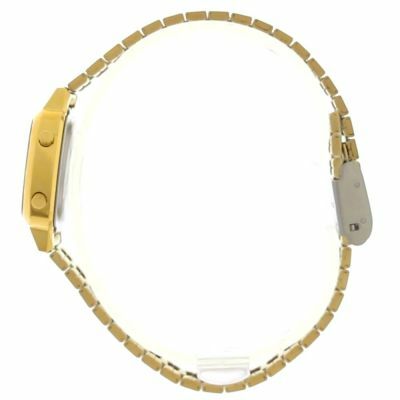 The bracelet strap is very adjustable and also relaible. I am very pleased that I bought this watch. For a number of years I have had to wear a Gents watch to get the alarm facility. I am totally pleased with my purchase and cannot think of any adverse feature. Even the price was very good. Am so glad I bought the watch, I love it, its perfect colour, and water resistance, perfect for me. Definitely would recommend to anyone. I brought this watch as an everyday watch to wear with basically everything. Its a great light weight watch, doesnt leave any green marks. Very easy to adjust the strap to your wrist, simply use a small screw driver or in my case a pair of tweezers to push the little thing up and adjust. If unsure just search it on youtube. So far Im loving my casio watch. Looks great feels very light on the wrist. The delivery service was excellent very fast and free! And the price is also great, cheaper than other retailers. 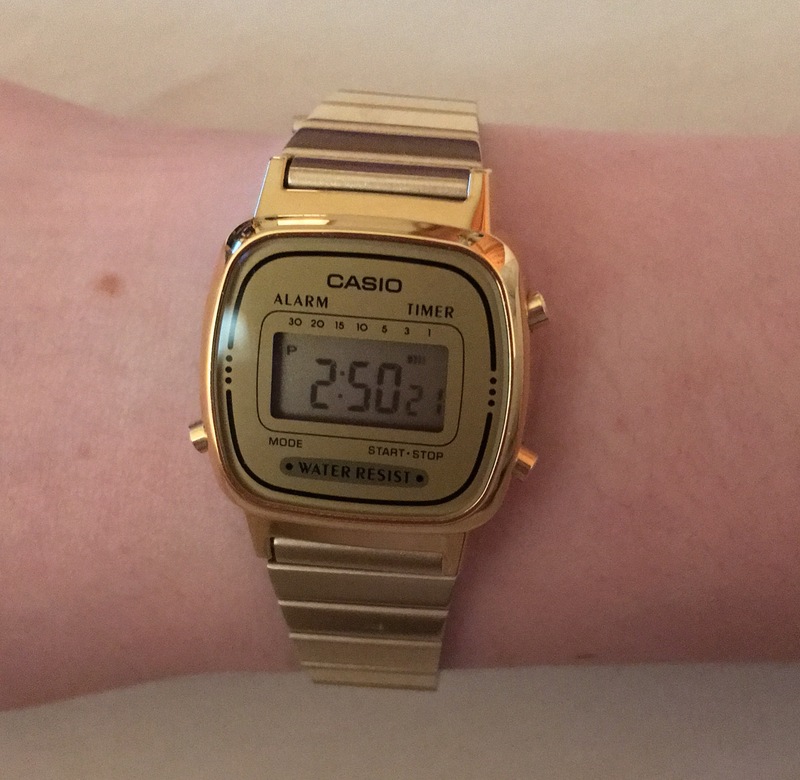 My 18 year old Daughter wanted a retro looking watch for day to day use and loves it.. Nice and simple and looks really good and at a great price. I bought the gift for my girlfriend and she loved. My girlfriend was very pleased with the look of the watch, the watch is small but elegant and was exactly what I was looking for! 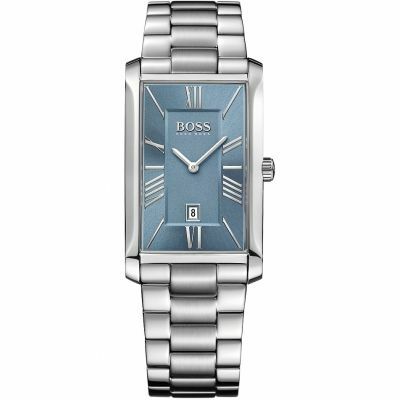 An elegant, classy watch, as she has small wrists, watches can look too big, however this watch was perfect. The watch was very easy to adjust the strap I found a video online that demonstrated how to do it using a fork so it fits perfectly. Considering how cheap it is, I think this watch looks very classy and it has a nice weight to it without being heavy. I am really pleased with the fact that the metal does not rub off and its water resistant,has an alarm and is easy to use, it can also be adjusted. Well worth it. Also much cheaper online than other places I have seen. I was also very pleased with the gift wrap as it had been beautifully wrapped and i would recommend it to anyone that is buying a gift.Overall I think its a beautiful everyday watch for any occasion, I am so glad i decided to buy this, the watch looks expensive even though it so affordable,with the cool vintage digital design. I would absolutely recommend your service to anyone that is looking to buy a watch! Package was left on the doorstep tough while I was at work...could have been stolen by anyone passing! Luckily it was still on the doorstep when I returned home from work that evening. The product was smaller than I expected however I find it to be the perfect size. The display is easy to read and there are many useful functions such as alarms and stopwatch etc. I was impressed by the quality and the strap is easily adjustable however this is not included in the instruction so I had to search for a how to. Very good product and low price. Quick delivery, beautiful watch had to go on youtube to figure out how to adjust it, but overall very pleased with the product! great watch with vintave style. Simple design, nice gold colour not too yellow or brassy looking. Really happy with this watch, even smaller than expected but it looks very cute on the wrist and i quite like the fact that it is not bulky. Love the display-so easy to tell the time and even has a day/month feature. Alarm and timer are also useful features. However due to the way the strap is made i did have some threads from my jumper caught between the links- but this was really nothing major. All in all would recommend this- cant really go wrong with such a classic design and such a lovely gold colour too! The recipient is very happy with the product. Im not happy about having to come back to the site repeatedly after getting e-mails saying its back in stock to find that I cant order it because its out of stock. Good web retailers allow you to place the order anyway and then tell you when its being shipped. The watch feels of good quality and is a very nice gold colour. The watch is very petite and would be for those who prefer small, bracelet looking watch styles. The digital settings are very easy to use and can be done without the instructions as there are only 3 buttons to use. The digital display is quite small but unless you are hard of sight is easy to see. All in all a very nice stylish watch that also has the casio retro feel about it, and very good value for money. It is lovely, the face is a little smaller than I had first thought but still good. Excellent, speedy service from the Watchshop ... and the watch, a gift for my girlfriend, is perfect ! Thanks ! Just what I wanted at a very reasonable price. Perfect everyday watch, but still looks good dressed up on a night out. Smashin features : light, alarm, stopwatch. Also water resistant. All in all a damn good watch! I love this watch. Its easy to read, adjustable, and looks good. The only thing I found was a bit a let down, was how to actually adjust the watch itself. There isnt instructions on how to do so, however when I found out how to adjust it, it was straightforward. beautiful watch, great for small wrists! the colour is really nice and doesnt come off at all. unfortunately, it scratches easily, but thats something you cannot avoid when you wear it everyday! Great product, exactly what i wanted. Quite small so its more of a subtle watch, easy to use. Has a stop watch, count down timer and alarm. Easily adjustable strap. Only possible downside is that the date is not displayed on the screen (you must press a button to see date), though i suppose that is because the screen is small. Also, there is no illuminator to be able to see the screen in the dark. Apart from that its a perfect watch. Fab watch, great service! Best reaction to a present of a Casio digital watch since the late 70s! I purchased this watch as a gift for my sister for her birthday. She was looking for a watch for every day use and this lovely little retro watch that really suits my sister 'the fasionista' . It was easy to adjust the straps to fit her small wrists and she was delighted with it. Lovely compact fashionable watch. Only drawback was that instructions weren't included on how to adjust the strap. This is the second time I bought this exact same watch (first one to myself, second one for my sister as xmas gift). The watch is very stylish which matches with all outfits and it's does it job, i.e. show the time. The wrist band can be easily adjusted. The price is very reasonable, very good for value. I love it! It is feminine without being at all girly and looks great with all kinds of outfits. It has that clasic look and is perfect for thin wrists. You can easily adjust the straps to fit any measure. It also has an alarm, a timer, a chronograph and a date function. I found it very easy to set up and to use all its functions. Watch looks fantastic. I bought it for Christmas present for my wife, I hope my wife will love it. Watch came very quick, it was about two days after I bought it. It's a beast! Really made up with it! Had plenty of complements too :)! Very fast delivery and my gf was very happy with the watch and never stops wearing it! Great quality. 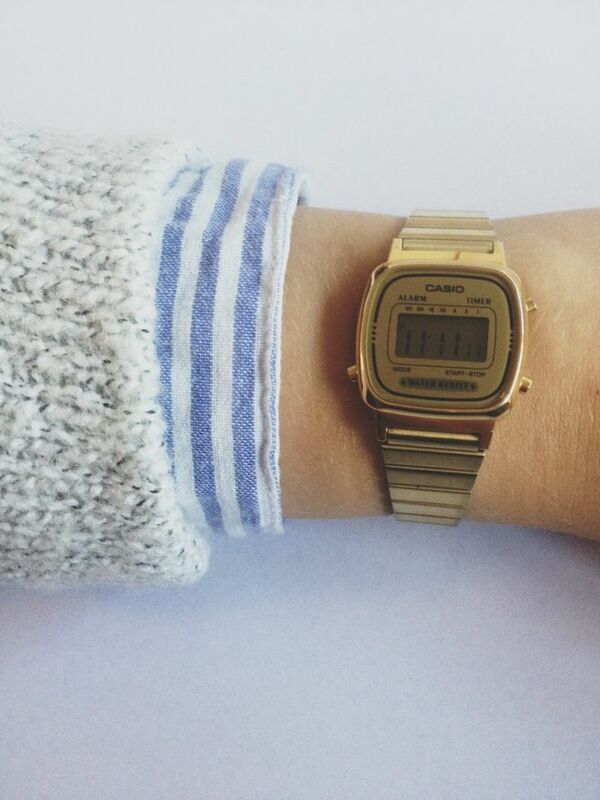 Love, Love, Love my new ladies gold Casio! I already have the silver version and the classic black rubber one so this fits in to my little collection perfectly. Different colour for all occasions. The strap is easily adjustable to fit my little wrists and the style is iconic retro! 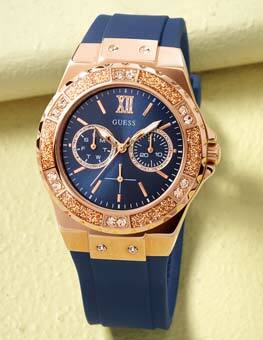 Watch Shop sell this at such a competitive price compared to other high-street retailers. Will buy from here again! I love this watch, it is very slim, chic & feminine without looking too much like just a piece of jewellery. The only feature I can think of which could be added would be a button for a back light where you culd see the time in the dark. Classic, timeless watch and is functional and practical. It has a handy stopwatch for those sporty people or not. A separate button to select the date and year, but easy to comprehend the instructions and set the watch timings. I love this watch and the features are simple yet effective.